The Internet connects us all, but it's easy to take for granted what a crazy accomplishment that is. After all, plenty of us live on different land-masses. We've got to get that sweet, sweet Internet across the deep blue sea somehow, and these are the underwater 'net pipes that get the job done. 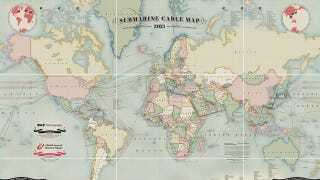 TeleGeography has just updated its Submarine Cable Map for 2013, and the result is a fully interactive picture of the countless tendrils of Internet that we've laid deep down on the ocean floor over the past decade and a half. You can peruse the staggering (but very slow to load) interactive map over at TeleGeography's website, or you can scoff at the idea of dropping a whole $250 to buy a physical copy.